Why pick a back carrier? Baby wearing needs to be comfortable, convenient and flexible for your little one, as well as for you. So, when is the right time to transition from front to back carrier? And what type of carrier should you buy? It is a personal choice and will depend on the wearer and baby. Suitable to be used only once your baby is able to sit upright independently (from around six months). A backpack carrier is the best choice for our family now as Norah’s weight is pulling my shoulders forwards and she is frustrated with limited room to move and nothing interesting to see except mummies chin. Moving on to a framed carrier compared to wraps and our soft structured Ergo carrier, which supports the baby from knee to knee in an M position, is a big step. When buying for baby I always go with parent recommendations and trusted brands. Thule is a well-established company who specialise in transport and safe, stylish products for those with an active lifestyle. 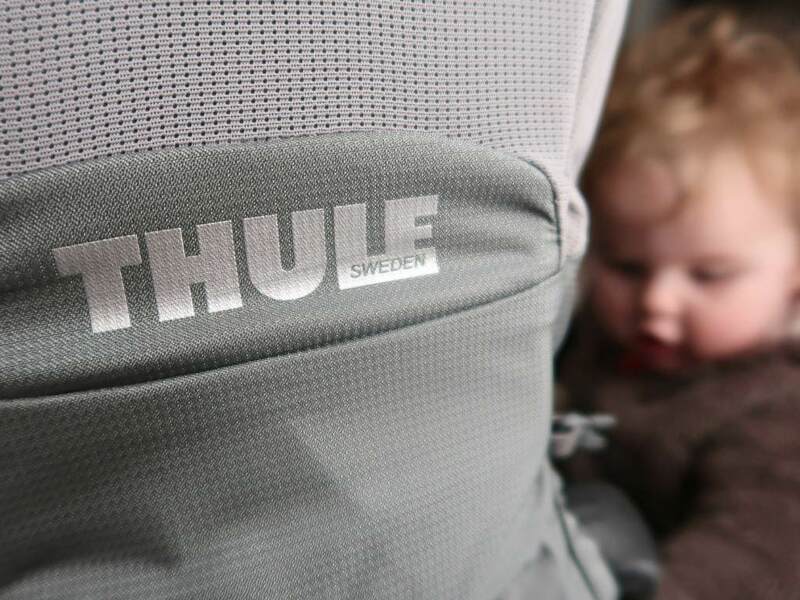 Thule make quality backpacks, both for hiking and for winter sports, so we were keen to test out the top of the range child carrier, the improved Sapling Elite to see if the superiority and functionality matched what we’ve come to expect from this Swedish brand. Straight out of the box I immediately thought, well this looks bulky. Size wise backpack carriers are large, especially ones with additional storage and a rigid aluminium frame for reinforcement. Weight luckily is not an issue. I love that it arrived fully assembled and the grey colour with blue tones is modern and understated. Instructions are available to download on the website and I quickly got to grips with exploring what goes where and how things work. The adjustable bar to change the torso sizing with S, M, L & XL is a fantastic versatile feature (simply depress two grey buttons on either side) and it locks into place securely. Once you know your sizing you can fit the backpack to your body in five minutes. But how reliable is it on a long walk? What are our top five things you should look for when reviewing a carrier? Parent and child comfort, functionality and ease-of-use, practicality in features and value for money. NOTE: Rather than struggling to turn to look at your child the Elite has a handy viewing mirror. When fully loaded how easy is it to get on? Practice getting the pack on. Use support like a chair to gently hoist yourself up, or with or the help of another adult. When on daddy’s back remember the height so you don’t bump babies head on doorframes! You can carry your child in a sling or baby carrier for as long as they are content and you’re happy carrying them. Our baby daughter at 8 months can’t say if she is comfortable but she will happily sit in and look at the world without wriggling or crying. Framed carriers, such as the Sapling Elite, have a narrow, height adjustable seat (for different body lengths) that bends easily on the sides to avoid pressure points. One downside is that it does not seem very padded. Ventilated side panels cater for growing bodies. It also efficiently distributes the child’s weight by providing inner thigh support with padded straps. The removable stirrups for the child’s feet let your little one rest their legs. The chin pad on the Sapling Elite is reasonable but there is a Velcro tab right in the centre, we throw a muslin over it for extra protection and that works well. NOTE: Weight restrictions for the Sapling Elite are 22kg and the child needs to be able to sit up unaided (around 6 months) to use the carrier. Getting the child in and out. You can lower your child in or one of the side panels releases via a buckle, making it much easier to get your child into and out of the seat. On the easy to use harness the shoulder straps buckle at the chest which does make it a tad difficult if Norah is wearing a fluffy coat or lots of layers. There are snap buckles on both sides to further secure your precious cargo. The kickstand being separate legs instead of one framed piece is useful. It allows easy access to the bottom storage. The kickstand is easy to pull out and by putting the carrier down, extending these and using the very handy stomp pad to stabilisze the carrier lifting your child out is simple. You can also easily reach behind you and retract the stand if you used it to help get your child in. Much more than just a basic carrier, I am really impressed with the amount of storage (secure zipped compartments of all sizes) and how well thought out placement is. The mesh pockets are handy and base compartment is very large. You can easily fit in a raincoat and all the nappies, wipes, snacks and essentials that you need for your little one. The removable backpack provides much more space than expected and is ideal for mum’s purse etc. The two hip pouches are easy to access and my camera fits nicely into. The difference between the Thule Sapling and Thule Sapling Elite is the extra and detachable bag at the back, very convenient when travelling. The detachable bag gives you the option of leaving the carrier in the car and pop out for shopping etc, without the need to carry extra bags for such. The material is heavy duty but durable and not rough or uncomfortable. It wipes clean easily. Tip. Don’t weight yourself down with unsecure stuff just because there is oodles of space! The Sapling Elite offers easy adjustments for a proper fit (for both men and women) and an adjustable child seat, with shoulder straps and stirrups to ensure your little passenger is secure and comfortable. There is an integrated hydration pack sleeve for serious hiking! The semi-rigid sunshade is very effective, lightweight, stored flat, easy to deploy and offers good coverage but it can be tough to put back into its compartment. It is very versatile. With the ergonomic and comfortable design, the child’s weight is well distributed through the frame. There is dual access for child placement. The load stabilzier straps help to hold the child close and stomp pad prevents the carrier from slipping when removing your little one. There is lots of, and really well thought out storage for your family’s gear. The zips are all strong and plastic buckles thick. If you are only intending to use the carrier once or twice then the price may seem high. That said, I always encourage parents to buy to meet their needs. If you are an outdoorsy family or use a carrier often then this is the perfect buy and you will get your monies worth in the quality of the Sapling Elite. The carrier is built to be sturdy and robust and this is reflected in the size. It does not pack down small for transport purposes, so this could be considered a negative. The basic product dimensions are height 28.75 inches, width 12.25 inches and weight (without a little person in) is 7.9 lbs. If you overload the storage compartments (as you may be tempted too as there are an abundance) then the weight of the child and gear can be significant which could make it cumbersome. Though this issue is not limited to this model it’s just common sense with any type of baby carrier. You need to buy the additional rain cover. The Sapling Elite is a fantastic option for families with active lifestyles and offers a comfortable and safe way to introduce your children to the outdoors! It is a serious bit of kit and going to be perfect for at festivals! Note: We were kindly gifted the Sapling Elite for the purposes of this review.